This time next week I'll be in gay Paris, probably nervously pacing the apartment or, with luck, sitting outside a café in the sunshine. Another good week really. I did a club run on Tuesday, generally taking it a little easier than normal but pushing the pace strongly in the last 1.5 miles just for the positive buzz. Totalled up at 5.5 hilly miles. On Thursday I ran with the club again, this time a 'short hill repeats' session. I'd expected a very slow but hilly 4 miles but it ended up as 6.5 miles including 10 times up and down Tinshill Drive. I didn't quite go all out but it was still a tough run and maybe not in the spirit of the taper - especially as the plan said it would be a 2 mile jog following 5 miles on Tuesday. Today I went for a run with Sue. We'd never done that before and it was nice to go along the grey and windy canal side. We set off to do 3 miles together with me then adding 5 on for the prescribed 8 easy miles but I repeatedly lied about the distance so that we did 5.3 miles together - just to show her that she can do more than she thought. She seemed pleased as its a 6 mile race she is building up for. I then just tagged on an extra 1.7 brisker miles to finish at 7, really to try and offset the tougher than planned earlier part of the week. Weight loss has been good too. By Friday morning the scales were down to a fantastic 12st 3.0lb but a bit of a binge has them temporarily at 12st 5.8lb today. I want a good day today and tomorrow to be back at 12/3 for Monday, after which its maintenance and then carb loading. Blister still healing very slowly and beyond that no great physical problems. I am getting increasingly tetchy though. I probably need to get a good chunk of packing done this weekend in order to feel in control, particularly as I have a tough week at work before we go, including 3 meetings (one in Southampton) and several documents to write. That's the first week of the taper out of the way. This time in 2 weeks and Paris will all be over and done with. For this year at least. More on that later. Not been a bad week really. A few highs and a few...well...not so highs I suppose. Monday was the warmest and sunniest day of the year so far and after starting my work early I decided to go for a walk at dinner time. The walk itself was quite pleasant and I discovered a few ginnels I didn't know were there but going out in desert boots was a mistake when I had a slowly recovering blister on my foot. It was painful after 15 minutes and when I took a look afterwards the blister was larger than the compeed dressing and didn't look to healthy. I trimmed it (delightful) and later went to the surgery and the nurse cleaned and dressed it. Its been getting slowly better since. On Tuesday evening I went out for a club run. It was 7 miles, hilly and (for me) pretty brisk but I did well and felt great afterwards, particularly as I felt a little under the weather before. Then on Thursday I went for a 4 mile run from home, hilly again, and whilst it was ok overall I could still feel Tuesday's exertions in my legs. Saturday's LSR was due to be 12 miles and that left me with an unwitting dilema - it wasn't long enough for me to focus on and prepare for beforehand but was lengthy enough to be a pretty substantial effort on the day. 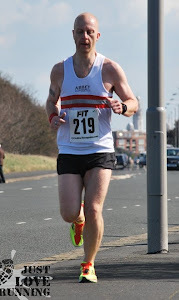 It wasn't great but I didn't leave in the best frame of mind, with insufficient water, most of the kit I'd expected to wear still in the washing basket and no real idea of what pace I wanted to run it at. Should I go for a quick 12 miles well under marathon pace, practice sustained running at the pace I want to go at in Paris or take it really easy and slow right down? In the end I did a mix of the first two. At this stage I'm planning on doing Paris somewhere between 10.00 and 10.10 a mile and the first 8 miles were all between 9.56 and 10.06. After that I did speed up a little to finish at an average of 9.49 partly due to adding on an extra 0.6 miles and running it at 8.14 so I finished on a high. At 6 miles I felt the dressing covering the blister bunching up and when I had a look the whole dressing was coming loose meaning I'd need to run back with no covering. Fortunately no great damage seemed to have been done. An hour at the gym followed today, mainly on the cross trainer but with a good stretching session too. Best news this week has probably been weight loss. After over eating again on Monday evening I've been very focussed since and was rewarded today when the scales registered 12st 6.6lb. My target at the beginning of the year was to get below 12st 7lb for Paris so hopefully I'll knock another pound or so off from that by this time next week. With Paris being so close and Edinburgh not too far behind thoughts have inevitably been towards 'what next' and I think I now have a clearer idea what. Marathon training has given me a good framework for fitness and weight loss and I want to maintain that and take it a little further too. Ideally that'll lead to a sub 4 hour marathon at some stage but to do that will probably need harder training and more training. On the one hand I could go for it for an autumn marathon - either Berlin in September or Dublin in October - but if I want to do a spring marathon next year that would mean 4 marathons and 15 months pretty constant training and I'm not sure that would be the wisest idea. Instead I think I'll take a few easy weeks after Edinburgh and then lose any remaining weight and try to do some pressure free running - shorter runs but more frequent and harder - with a view to getting PBs at 10k, 10 miles and half marathon. That'll give me a good indication of what I'll be capable of next year as well as putting me in a strong starting position for tougher marathon training. There's just 2 problems though: what do I go for next spring - Paris or Rome - and will I be able to find 3 early autumn races to go for as so many seem to have dissapeared in the last couple of years. Its been a pretty good week. A couple of niggles, some things to ponder and an imperfect diet (again) but its also been a confidence boost. No run on Monday but I did have a sports massage to help try to keep the legs in rude health. Not as painful as a fortnight before with correspondingly fewer knots. By Tuesday evening's club run any lingering aches and pains were gone and once again I felt quite springy. Some early Garmin problems aside it proved to be a useful run too. Went with the usual group along the ring road, up the hairpins of the hill into Meanwood, up to Far Headingley and back along Otley Road. In terms of the run itself I was pleased with how the hills went - I managed them well enough and seem to be getting used to them again. For the last section we did a timed mile and whilst I probably got the pacing wrong I was pleased enough with 7:19 at the end of a hilly run particularly as I didn't go all out at the end. No aches and pains the following day, aside from a bit of soreness in the left leg mainly due to walking and running 'funny' to avoid aggravating the blister - something I'd had to concentrate on stopping during Tuesday evening. Thursday's 2 miles, for the second time, didn't happen. I'd hoped to sneak in 20 minutes into my Thursday morning but work was fairly busy. In truth I'd probably told myself it was expendable too. I'll make sure I do it this week. Thursday evening I was due to give blood. Its something I've been meaning to do for a while as its a good, socially responsible thing to do but its also something I dislike doing as I tend to feel faint and sick a couple of minutes afterwards which is quite embarrassing. By the time I got to Adel War Memorial club I wasn't far short of feeling hysterical - fear of passing out, worried of looking a pratt, concerned that giving blood a day and a half before a 20m run might be unwise, conscious of the sore throat I seemed to have woken up with. I haven't been like that before and I wonder if it was something to do with general marathon anxiety - certainly my blood pressure readings (taken each morning) are generally a little higher than in previous weeks. Long and short was they de-registered me! Apparently a record of feeling ill after giving blood on 3 occasions means they consider you a risk - probably in terms of litigation as much as health - as people have died afterwards. Disappointed but relieved. I can now not give blood with a clear conscience. Anyway, back to running and this week's 20 miler. I'd been a bit concerned as the previous 20 miles had really tested me and I was sore for a few days after too. As a result I decided to deliberately slow it down to about 10:10 a mile so that I could finish and still feel there was something left in the tank - psychologically that's the feeling I wanted to take from the final peak LSR into the marathon. I also added on a 2 mile loop at the start so that my final mile before turning around wasn't going to include Bingley's 3-rise and 5-rise locks and decided to include a road section for a couple of miles on the way back just as a change from the canal. All creative planning that paid off! Weather wise the forecast of heavy rain and high winds that I'd seen on Thursday didn't transpire. It was very windy (and largely straight at me on the way out) but there was no rain at all, allowing me to do a LSR without a gillet or tights. The opening 10 miles were all done slower than 10 minute miles. Some a few seconds over but for the most part they were around 10:30 a mile. That was fine and allowed me to feel fairly fresh at half way. It also disguised another change I'd made for this week's run - the timing and resting rules. Normally I've stopped to take gels and water or to stretch, and whilst I may have paced up and down during this period they have constituted short breaks and they haven't been included in the Garmin timings - I only measure elapsed running time. That's all fine for training but its not the approach I'll take in Paris and it isn't how a chip time will be calculated. In Paris I plan, for the most part, to walk through the water stations so on Saturday I practised this. I left the timer going all the way through and tried to take gels on the run and drink while walking. That reduced the overall pace by making every 3rd mile or so after 6 miles slower than normal. Sometimes the walking was only for about 10 seconds, other times it could have been 30. From about 9 miles the blister began to give constant pain - more so if I turned and 'twisted' my foot on it - but it proved not to be quite as bad as the previous week so I'm hoping it is slowly healing and that the taper will allow it to do so more fully. Mile 11 was faster, at 9:45, and the remaining miles, for the most part, were between 9:30 and 9:45 as has been usual on my LSRs to date. There was one at 10:29 where I took a gel walking up a hill and then had to fiddle to get water from the 2 bottles behind me in the belt, the penultimate mile at 9:58 as I sensed the finish approaching and a final mile at 8:45. The quicker final mile hadn't been planned but when I realised the penultimate mile had slowed I speeded up a tiny bit and then when I reached half a mile to go I pushed harder still. This was partly because I didn't feel 'done in' as I had on the previous one and a fast last mile would underline this point to myself - that I could have done more. Afterwards I felt good, and whilst the cold bath didn't completely alleviate any soreness or stiffness it wasn't far off - another pleasing difference to 2 weeks prior. Better pacing, the benefits of previous training and a positive mental attitude before and during combined to great effect for me and have left me feeling confident. Weight loss wise its a carbon copy of the previous week. Stick well to the program for the first 4 days and see the weight fall (by Friday morning I was down to 12st 8.2lb) but then vague carb loading on Friday followed by severe over eating on Saturday & Sunday put me back to square one by Monday's weigh in. Saturday & Sunday were binge style. On Saturday we went again to Agraah where I ate alot but then inexplicably followed it up in the hour or so when we got in with 4 pieces of toast, a couple of biscuits, a packet of crisps and a piece of chocolate. By 9pm I was really tired but was so bloated and suffering stomach pains I couldn't get to sleep until about 1am. Yesterday the stomach eased during the morning but then in the evening I ate a huge meal at a Persian grill house and followed that up with 2 packets of M&Ms. Including today I have 12-14 days left to lose a little weight before I need to maintain weight and then carb load pre-marathon. I don't have the distraction of mini-carb loading sessions before LSRs and nor will I have the feeling of justification for bingeing that longer LSRs provide. Lets see what I can do with that time. I'd still like to be under 12st 7lb a week before the marathon but that means 4lb loss in that time. Fingers crossed. Typing this while I kill time before going out for a run with Abbey Runners. Its just after 6pm and still light and bright. Yesterday I noticed a lot of bushes are in bud. Spring is on the way and maybe that's reflected in how I feel about my running. The stiffness eased last week and by Tuesday all that was left was a little stiffness in the outer quads - a legacy of running fast down steep hills I was unused to - but I missed Tuesday's running club session. I got in at 7pm after a 12 hour round trip for a meeting; it was cold, wet, windy and not at all tempting for running. Instead I went out on Wednesday morning for a little over 7 miles. I went out with no particular plan but ended up averaging 9.15mm after running the last 3 miles at tempo pace. Afterwards I felt good. I planned to do a couple of miles on Thursday but a heavy workload put paid to that so my second and final run of the week was Saturday's 16 mile LSR. For the first time I did a LSR in shorts, Skins compression shorts and road shoes - the weather had improved and I wanted to get used to running in Paris gear. The shorts worked a treat in staying put and preventing chaffing and the lighter road shoes felt lighter and free-er than clunky trail/road hybrids. The run itself was mixed again. I ran a more even pace with 10:31 being my slowest mile and 9:21 the quickest, both a contrast with the previous week's 11:20 and 8:45. The blister re-asserted it's presence after 9 miles and at around 12 and again in the last mile it felt like I was tired and having to push myself more than I expected. That said, my overall pace was 9:54 - only 6s a mile slower than the previous week and at the end I felt more energetic. A particular plus was that after the cold bath my legs felt absolutely fine - no stiffness or even tiredness and yesterday's massage revealed fewer knots than 3 weeks previously. On the one hand the idea of adding 10.2 miles on to that was frightening but on the other I wonder if the fatigue at the end is part psychological - simply from knowing it is the end. Speed of recovery suggests I wasn't by any means wiped out. I ought to also remember that whilst I was expecting an easy run compared to 20 miles, a 16 mile run is still a pretty big undertaking. At the moment I'm planning on doing Paris at about 10:10/10:15mm pace. That would see me home in under 4hrs 30 mins and the slower pace, aided and abetted by carb loading (as opposed to dieting! ), weight loss, lighter kit, atmosphere, taper etc should limit the likelihood of me blowing up in the last 6.2 miles. After a couple of stagnant weeks the weight fell off a bit last week with my weight by the middle/end of the week falling to 12st 8.8lb. A huge curry on Saturday and then a trip to the cinema (popcorn, choc ice) followed by lots of home made flapjacks on Sunday reversed that a bit but with two and a half weeks of dieting to go I'm confident I can go below the target I set myself at the start of the year - to be below 12st 7lb by Paris. In fact, my only concern is the damn blister. Its a huge thing that burst on Saturday to reveal red, angry skin beneath. Its dressed with a Compeed dressing but still hurts under pressure and if I'm not careful I walk on the outside of my left foot to avoid discomfort. Hopefully its on the mend beneath the dressing and in 4 days time and the last 20 mile LSR it'll be ok. There'll then be 3 weeks for it to heal nicely pre-Paris. Last Monday I was still a little stiff in lower legs but I went for a sports massage. Forty excruciating minutes later and I was still in pain and remained that way for the rest of the day. 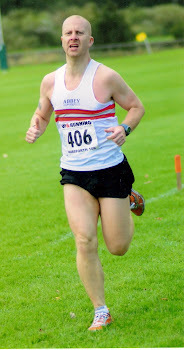 Thankfully, by the following morning my now largely un-knotted leg muscles felt considerably better and thanks to the massage magic I was able to run easily with Abbey Runners again Tuesday night. This week was 6.2 hilly miles but about 30 seconds a mile slower than the previous week. I enjoyed it and even the 'killer' hills felt easier than they had the previous week. No major soreness the following day either - just a little tenderness in lower legs. By Thursday all seemed to be going well again. I deliberately took it easy and did the prescribed 2 mile jog with no problems and had been watching my food intake for the week and was losing the weight I'd gained the previous week and going a little beyond: 12st 5lb by Paris looked feasible again. I can't really say the wheels fell off after that but a couple do feel a bit looser - though they covered some decent miles in the process. Saturday's 20 miles had a few changes from previous runs, and not just the extra distance. I wore different trail shoes to run in, I wore the new orthotics, I wore a pair of Skins compression socks under my tights, carried a bottle of water as well as the 2 small belt flasks and used a range of Overstims energy gels. In the event some of these little changes may have had a big effect on the run - some good and some not so - but it proved a difficult challenge and one for which I can't decide if I'm pleased or disappointed with. The first 9 miles went pretty much as per standard, albeit that I was just over 100s ahead of the same point on the 18 miler of 2 weeks before. In itself that wasn't too odd as my pace increased by about 10s per mile for each of 14, 16 and 18 mile LSRs but it may have been taking a bit more out of me than may have been wise. Mile 10 slowed a little but it included 2 large sets of locks - a 3 rise and a 5 rise set - so he steep hills and only moderately slower pace may have also contributed to later fatigue. By then I was also battling 2 ailments. Firstly my orthotics had begun to bunch up under my toes causing a large blister under my left big toe and pain in my right toes from their feeling like they were gripping onto a ridge. Secondly I'd developed a tight feeling at the top of my left calf, almost behind my knee. I had something similar a couple of years ago on a long run in Scotland and in the end it 'twanged' leaving me hobbling for a couple of days but left no legacy as I ran a hilly 10 mile race a week later. Mile 11 meant 2 steep downhills and a correspondingly quick mile but it also may have contributed to the stiffness I later felt in my quads. At the end of that mile I stopped to (temporarily) reposition the insoles and when I set off again I was closely following a group of 3 lady runners. They weren't slouches but I guessed that they were going slightly slower than the sort of pace I wanted to be running at so I decided to pass them. I don't know if I was wrong in the first place or if they speeded up as I passed but it contributed to an even quicker mile - some 45s faster than the quickest I'd have wanted and led into another brisk mile following it. From then on it felt tough. The blister was a pain (literally) and I could feel the insoles bunching again, but I also felt tired. I guess the hills and faster pace were just a little more than I was ready for. That said, the next 5 miles were all done fairly metronomically - all within a 4 second band - but I consciously needed to push myself a bit. The last 2 miles slowed a little - still under my target pace but 12-19s a mile slower than the previous 5 miles and during this period I could feel my legs stiffening. By the end I felt done in. I did the usual post run routine but the magic cold bath didn't seem to work it's wonders and my legs felt stiff for the remainder of the day. They eased a little for yesterday and a little more again today but there's still soreness behind the left knee, lower left leg and in the outer quads. 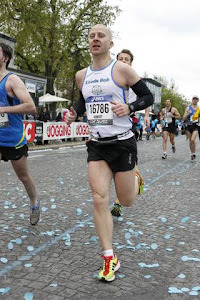 Overall I'm pleased with the pace I managed; I'm pleased to have done the 20 and will benefit from the training. I'm a little concerned at how I felt relative to having to do another 6.2 miles and by the pain in my legs since. I guess I'll learn from the experience for next week, the 20 that follows it and for Paris.